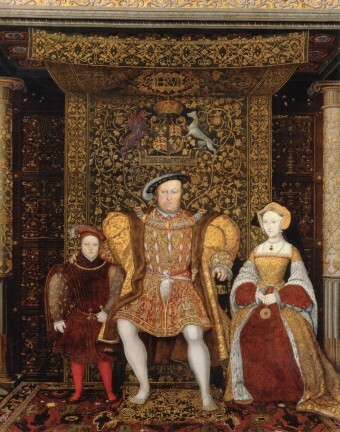 The Act of Supremacy, passed by English Parliament on this day in history, 1534, declared King Henry VIII head of the newly minted Church of England, had a lot more to do with politics than it had to do with theology. It also was influenced by Henry’s complicated personal life, which was rendered even more frustrating by the Vicar of Rome’s refusal to grant him an annulment from his wife, Katherine of Aragon, so he could wed his (temporary) love, Anne Boleyn. King Henry marriage to Queen Katherine, although a happy one for many years, had failed to produce a male heir. 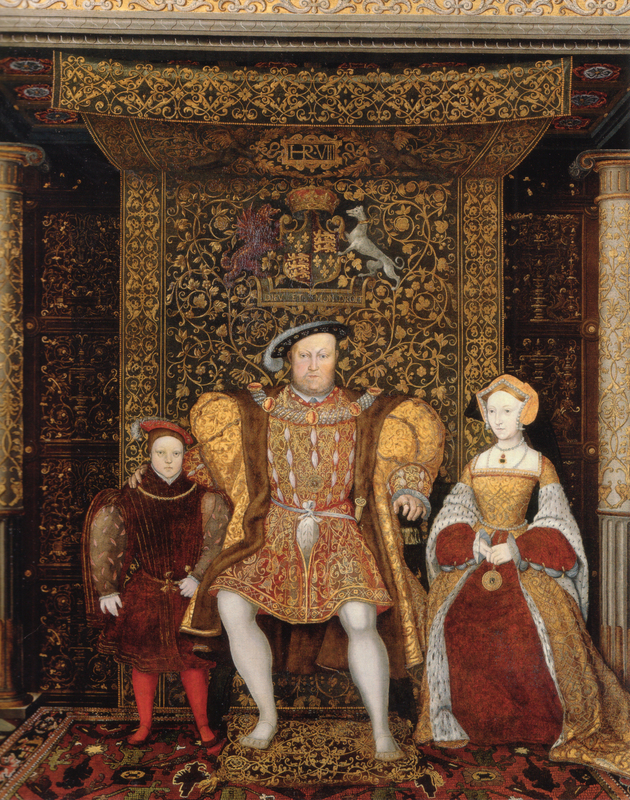 This was no small matter in a royal marriage, especially considering the Tudor dynasty had only begun with Henry’s father, and before that the country had suffered through many years of civil war. The couple had a daughter, Mary, but the King wanted a son to avoid any dynastic squabbles after his death. As the years passed and the odds of Queen Katherine delivering a healthy prince lessened, Henry convinced himself he was being punished for marrying his brother’s widow (Katherine had been married to his older brother Arthur very briefly before he died at 15). The young couple never “sealed the deal”, but the Pope provided a dispensation when Henry and Katherine married as extra insurance. No-one batted an eye at the time, as Arthur was a sickly kid and Katherine, who was pious even for the times, had sworn on damnation of her soul that they had never consummated their marriage. Then the elegant Anne Boleyn walked into Henry’s life and getting rid of Katherine took on a whole new urgency. He put his best guys on it, First Cardinal Wolsey, then Thomas Cromwell, then Thomas Cranmer (who by 1533 was Archbishop of Canterbury). Unfortunately, Pope Clement feared Queen Katherine’s powerful nephew The Holy Roman Emperor right up the road a lot more than the King of England across the ocean, so he put off dealing with the situation. For years and years. By the fall of 1534, Anne Boleyn was Queen Anne, and the couple had a daughter Princess Elizabeth (but princes were sure to follow)! Obviously, Henry was tired of being jerked around by Pope Clement. Calls for a reformation in the Church had already been happening for some time, including from respected humanists such as Erasmus and his close friend the English scholar Thomas More. But these men had never dreamed of breaking with the Church of Rome. But Henry did. Those around him who hoped the King would split completely with Rome filled the King’s ears with talk of the Pope ruling his kingdom, and his prelates and subjects serving the Pope before the King. The King surmised that swearing loyalty to Pope made all Englishmen “half his subjects.” This, of course, would never do. And Clement had excommunicated Henry anyway, so what did he have to lose? But, in reality, Henry was no maverick. The only thing that changed was the absence of the Pope. The Protestants in the realm who thought they won a major theological victory were sorely disappointed, because the King deviated very little from traditional Catholic doctrine or ritual. Henry just wanted to be the boss – and to have access to all of the Church’s vast riches in his kingdom, which he plundered with great gusto. Wow! This site (or at least this writer) has a “fixation” on King Henry VIII. There are SO many articles about him — really in excess of his importance. Sadly, the articles contain errors and prejudicial statements that beg to be corrected. I think that very few people believe that he really “convinced himself” of this. Rather, almost everyone believes that he PRETENDED that this was true and wanted to “convince” his subjects of it — partly because of his lust (for A.B.) and partly because of his desire for a son. This is an anti-Catholic slur and a foolish pretending (by the writer) that she could read the mind of a pope — somehow knowing what/whom he “feared.” The fact is that the “wheels” of the Church, out of a concern for justice toward all, turn extremely slowly. The pope was “dealing with the situation” in the way that almost all Europeans believed was appropriate, but it is hard for anti-Catholics in our time to understand and appreciate this fact. http://www.theanneboleynfiles.com/henry-viii-is-excommunicated/ — where an English translation of the actual text of the papal bull can be read.